Mammalian cell-based production systems are gaining increasing importance in the manufacture of biotherapeutics. The major advantage of mammalian cell expression platforms over bacteria and yeast is their ability to produce complex proteins and, when using human cell lines in particular, to add the correct post-translational modifications to these proteins. Examples for such cell lines are the well-known Chinese hamster ovary (CHO) cells, human embryonal kidney (HEK) cells, and Cevec’s more recently developed human amniocyte cell line CAP. However, generating a mammalian production cell clone can be a time-consuming and laborious process, as high producers are usually rare among the population of stably expressing cells. Various sophisticated screening devices have been developed to overcome the labor-intensive clone-selection process. Here we describe protocols for CAP cells allowing generation and identification of high-expressing single-cell clones without additional laboratory equipment within a short timeframe, using serum-free chemically defined culture conditions. Moreover, the presented procedures enable the screening of hundreds to thousands of clones with significantly reduced labor investment, identifying high producers without the need for additional gene-amplification steps. To identify the high producers as efficiently as possible, we compared different approaches. To this end, CAP cells were transfected with an expression plasmid for recombinant human alpha-1 antitrypsin (rhAAT) and then either bulk selected to generate a maxi-pool or 50, 100, 200, or 500 cells were seeded on a 96-well plate and subsequently subjected to antibiotic selection. The resulting mini-pools and maxi-pool were analyzed for rhAAT expression. When 50 to 100 cells are plated per well, mini-pools with expression levels significantly above the average level are readily identified (Figure 1). Since the corresponding mini-pools consist of 2–5 clones and mini-pools form in up to 80% of the wells, this method enables the screening of up to 400 clones from a single 96-well plate. As expected, with higher cell numbers (Figure 1C and D), all mini-pools express around the same lower expression level that is found with the maxi-pool (not shown). Moreover, slowly growing high producers in maxi-pools can easily be overgrown by low producers and thus be lost. This is prevented by the mini-pool approach. Experiments demonstrating that the mini-pool technique actually identifies clones that are not easily found in the maxi-pools are ongoing. For CAP cells, we have determined 100 cells per well as the optimal mini-pool seeding density. As these mini-pools consist of a limited number of clonal populations, only a limited single-cell cloning program is subsequently required to generate single-cell derived production clones from the high-expressing mini-pools. Figure 1. Screening of mini-pools from different seeded cell numbers: 50, 100, 200, or 500 cells were seeded in 96-well plates. The concentration of rhAAT in the supernatant of the pools was determined two weeks after start of selection by ELISA. Displayed are the 50 highest expressing pools of 50- (A), 100- (B), 200- (C), or 500-cell (D) mini-pools. To generate single cell-derived clones, an efficient and quick procedure that can be carried out in suspension without the requirement for feeder cells or serum presents a major benefit. Although some media and supplements for serum-free single-cell cloning of CHO cells have been developed, cloning in serum containing growth medium followed by subsequent adaptation of the clone to serum-free growth, which takes typically several months, is still common practice. With CAP cells we were able to generate a robust, serum-free, and fast protocol by using a changing media composition allowing the cells to grow in aggregates first and then shifting them to single-cell proliferation conditions (Figure 2). Figure 2. Typical growth behavior of CAP single cell clones during limiting dilution: CAP cells are plated on 96-well plates (0.5 cell/well) in a mixture of 80% Opti-Pro SFM and 20% PEM (Life Technologies) supplemented with one commercially available serum-free supplement. Cells start growing in tight clusters (A). After approximately two weeks, when a certain cluster size is reached, clusters are dissolved by replacing the cloning media mix with PEM medium (B) and are transferred to 24-well plates as single cell culture in PEM (C). Cloning efficiencies of >90% are typically reached. The outlined strategies for the generation of highly-producing CAP cell clones have been successfully applied to a number of difficult to express glycoproteins, among them hAAT, recombinant human C1 esterase inhibitor (hC1-Inh), and, in a collaboration with Nanomi and InnoCore Technologies, recombinant human hepatocyte growth factor (hHGF). HGF is secreted as a single-chain inactive pro-HGF (82kD) with one O-glycosylation and four N-glycosylation sites and is proteolytically activated by factors present in human serum. HGF is a potent multifunctional growth factor influencing morphogenesis, organ regeneration, and cell migration. Due to its mitogenic and angiogenic properties, HGF is of great value as a therapeutic protein. Within the public-funded EU project CARE-MI, the aim of Nanomi, InnoCore, and Coretherapix is to formulate monodisperse biodegradable microspheres as a depot for hHGF in combination with insulin-growth factor-1 (IGF-1). Microspheres are then used for the targeted delivery of these growth factors to the site of impaired perfusion caused by acute myocardial infarct in order to activate endogenous pluripotent human cardiac stem cells, inducing tissue regeneration. This strategy could be a powerful therapeutic option for repairing damaged heart muscle, preventing chronic heart failure. To realize this project, a safe and efficient production platform for hHGF is required. 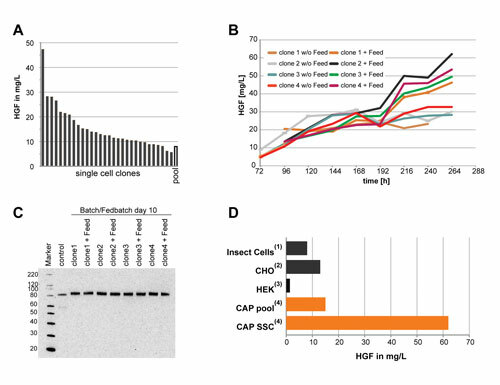 HGF has been expressed from a number of expression systems, including insect cells, HEK, and CHO cells, with rather low yields of approximately 1 mg/L up to 13 mg/L (achieved after gene-amplification) (Figure 3D). With our stable transfection and cloning protocols, we could easily identify HGF expressing CAP single cell clones that clearly outperform the so far published mammalian expression systems (Figure 3D). Twenty-two out of 30 analyzed HGF-expressing CAP cell clones yielded more than 10 mg/L of HGF (Figure 3A). In fedbatch processes, after 9–11 days, product titers above 60 mg/L of fully intact, glycosylated pro-HGF were reproducibly obtained (Figure 3B). Moreover, the serum-free chemically defined culture conditions ensure that only the unprocessed single chain pro-HGF is present in the cell culture supernatants (Figure 3C). In other words, a uniform product, which is easy to purify and to activate by endogenous factors present in fetal bovine serum or human serum, is generated. Figure 3. Generation of CAP single cell clones expressing recombinant human HGF: CAP cells were transfected with a plasmid carrying the hHGF gene sequence and a blasticidin selection marker. SCCs were derived as described above. After the initial screen, selected SCCs were transferred to fedbatch cultures in a 24-deep-well plate and HGF expression was analyzed (A). (B) Expression of HGF in batch cultures using CAP-CDM media and fedbatch cultures in CAP-CDM, with or without the corresponding CAP-CDM FEED, confirms that all four top-producer clones respond equally well to the feeding scheme. (C) HGF secreted from different high-producer clones shows the identical high-quality profile after 10 days of expression with or without feed shows no signs of product degradation or aggregation. 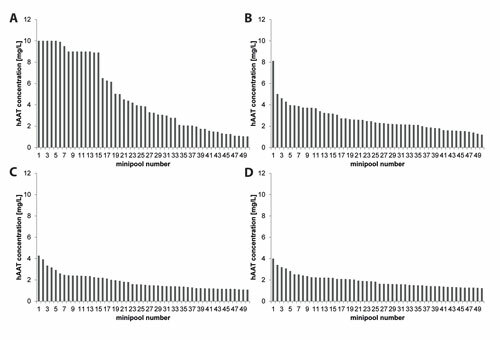 (D) Comparison of HGF expression in CAP cells to published levels obtained with other mammalian expression systems. We have developed a rapid and reliable protocol for the generation of single cell clones from the human CAP cell line by limiting dilution. Since an amplification step during pool generation is unnecessary to obtain high producer single-cell-clones the timeline of 18 weeks from transfection to clone identification is particularly fast. Utilizing the presented mini-pool screening strategy ahead of the single cell cloning process, the number of clones to be screened can be increased 100-fold without additional laboratory equipment, allowing an easy identification of the rare top producer clones. Jens Wölfel, Ph.D., is group leader of scientific support, Silke Wissing, Ph.D., is director of cell-line development, Sabine Hertel and Susanne Kraus are research assistants, Gudrun Schiedner, Ph.D., is CSO, and Nicole Faust, Ph.D. (Faust@cevec.com), is SVP of development & services at Cevec Pharmaceuticals.